I have never used any fairness cream. Even for the black spots on my skin, I have not used any cream ever. However, I've used several night creams, which helps the skin to Nourishing. 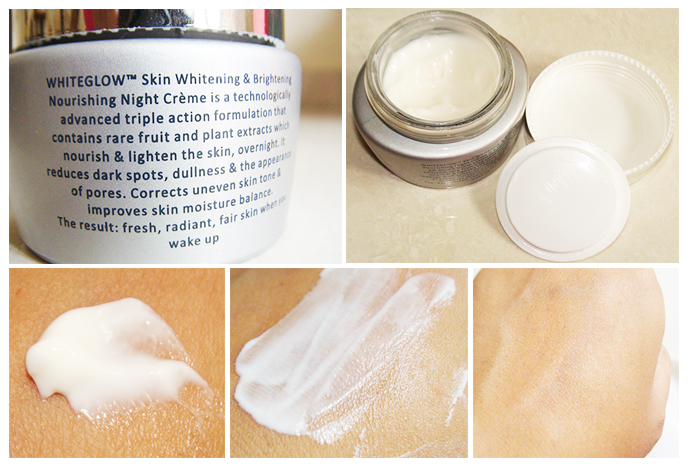 Such a night cream I've been using recently that is Lotus White Glow Skin Whitening & Brightening Nourishing Night Cream. So let us move on to see how this cream worked for me. 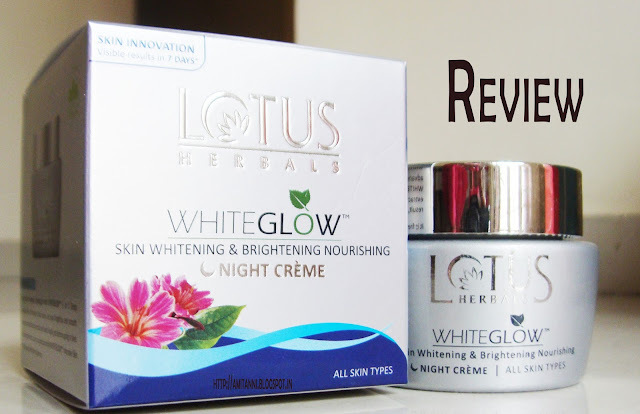 WHITEGLOW Skin Whitening & Brightening Nourishing Night Creme is a breakthrough from Lotus Herbals that lightens, whitens & brightens your skin, overnight. Lightens It lightens skin’s tone by reducing uneven pigmentation. Whitens It unveils visibly fairer skin by reducing dark spots. Brightens It enhances skin’s radiance naturally. WHITEGLOW Skin Whitening & Brightening Nourishing Night Creme is a technologically advanced triple action formulation that contains rare fruit & plant extracts which nourish & lighten the skin, overnight. It reduces dark spots, dullness & appearance of pores. Corrects uneven skin tone & improves skin moisture balance. The result: fresh, radiant, fair skin when you wake up. WHITEGLOW Skin Whitening & Brightening range is technologically advanced formulation that provides triple action on skin-LIGHTENING, WHITENING & BRIGHTENING with the help of rare fruit & proven plant extracts that penetrate deep into the skin to provide enduring action. The result, your skin looks fairer, flawless and radiant. It is free from harsh chemicals, that generally have side effects. Grape Etract(VITIS VINIFERA): Exfoliator-helps active ingredients penetrate into the skin. Mulberry Extract(TRITER PENOIDS, PHENYL FLAVONES): Tyrosinase inhibitor. Milk Enzyme: Block Melanin Pathways. Saxifraga Extract(EPIGALLOCATECHIN): Free radical Scavenger & tyrosinase inhibition. Apply after cleansing thoroughly with WHITEGLOW 3 in 1 Deep Cleansing Skin Whitening Facial Foam. Use your fingertips and smooth evenly onto clean skin over face and neck. Apply just before going to bed. For synergic effect, use in conjunction with WHITEGLOW Intensive Skin Whitening & Brightening Serum. Ingredients: D.M. Water, Light Liquid Paraffin, Glycerin, Isopropyl Myristate, Arctostaphylos Uva-Ursi (Bearberry) Extract, Camellia Sinensis (Green Tea) Extract, Milk Enzymes, Arachidyl Alcohol & Behenyl Alcohol & Arachidyl Glucoside, Polyacrylate-13 & Polyisobutene & Polysorbate 20, Hydroxyethyl Urea, C20-22 Alkyl Phosphate & C 20-22 Alcohols , Triterpenoids,Phenyflavones (Mulberry) Extract, Epigallocatechin (Saxifraga) Extract, Vitis vinifera (Grape) Extract, Xylitylglucoside and anhydroxylitol & xylitol, 2-Phenoxyethanol, Tocopheryl Acetate, Triethanolamine, Methyl Paraben, Propyl Paraben, Fragrance. The night cream has a nice heavy silvery color glass tub jar packaging with a broad base and wide mouth that helps to take out the cream very easily. There is a white color lid under the silver color screw cap. Packaging is travel friendly but it is little heavy so I do not feel comfortable while in carrying on my handbag. At a glance it seems like a very heavy and thick in consistency. But when I applied it on my face, I feel it very lightweight and spread easily without leaving any white cast and mask-effect. It is a smooth and non-greasy cream too. The cream is White in color and the fragrance is very fresh and light. I really love the flowery fragrance. Over the past two months I've been using this cream and I have not noticed any whitening and lightening effect on my skin. I applied Lotus White Glow skin whitening & Brightening Nourishing Night Cream, in the night and my skin feels bit cool just after application. In the morning my skin does feel very soft smooth and hydrated with a glow. But after washing the face skin remains same I don’t find any glow on my face whole day. The product has not kept its promise. This cream does not remove the dark spots. It is a very ordinary and simple night cream. But one thing I like about this product that it does not make skin so dry or oily. 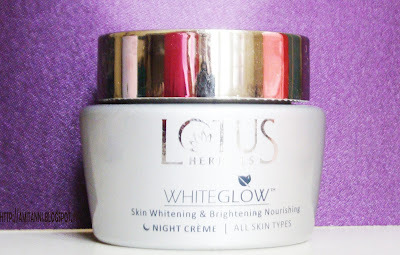 Overall, I can say that Lotus White Glow skin whitening & Brightening Nourishing Night Cream is quite decent pick for all type skin beauties. If you are looking for any normal night cream then think about it. But do not expect any whitening or lightening effect from this cream. Otherwise Lotus White Glow skin whitening & Brightening Nourishing Night Cream is a very average Night Cream. Have you tried this Lotus White Glow skin whitening & Brightening Nourishing Night Cream? Do you like it or does it not work for you? Follow Beauty and Lifestyle Mantra on Facebook, Twitter, Bloglovin and Instagram so you don't miss a post ! *** This post is not sponsored. All products are bought with my own money, and reviewed at my own discretion. Hair Care TreatmentsThe health of your hair and scalp can speak volumes about your internal balance. Factors like genetics, excessive use of chemicals, illness, weather changes and poor circulation are the major causes behind issues like hair fall, dandruff and damaged hair. I love about the discuss of blogs this cream show on top is very good and effective. great job about sharing your blogs pretty effective these blogs.